The 2019 49er, 49erFX & Nacra17 European Championship at Weymouth, UK, will see Father and son duo, Roger (65) and Simon (35) Coles from Lee on Solent SC competing for one last time together in the 49er, before Roger ‘hangs up his harness’. Simon’s first foray into 49er sailing was aged 16, and he owned his first boat aged 17, in 2000. Being an Olympic class, it can be a daunting prospect for club sailors committing to sail a boat against full time professional sailors. But there is a silver lining that is often overlooked amongst many sailors. While the Cole’s both agree it can be tough racing against the pros, putting yourself in the mix or in front of full time atheletes is what makes racing this boat so rewarding. They agree that there’s plenty of benefits having access to some of the best sailors in the world. “The Pro’s are happy to help with tuning tips, and often there is a training day before the events where an Olympic coach will be available. We have been helped by John Pink & Mark Asquith at these sessions”. The other positive side effect of the 49er being an Olympic class is the access and affordability of used boats and gear. With most top teams running multiple boat programs and renewing equipment regularly, you can pick up a lightly used set of sails for a fraction of the price of new ones. Unlike other high performance boats, there isn’t a million and one bits or rope to pull, just sheets, kicker and Cunningham, so you spend more time sailing and less time worrying if this or that is right (or fixing things!). At 65 years young, Roger is a testament to the class and its use-ability for a wide range of sailors. 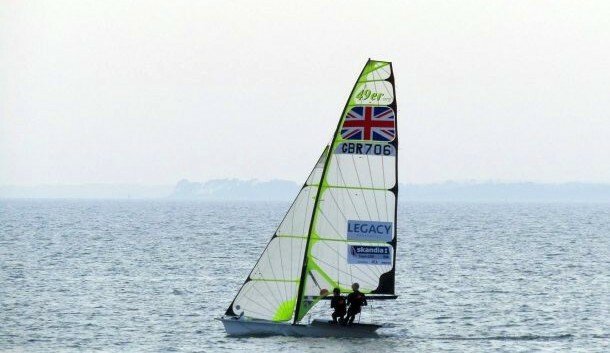 For the grass roots 49er sailors who are sitting on the fence about heading to Weymouth for the Europeans in May, Simon and Roger encapsulate what you can expect from the week of racing. To view the Notice of Race and submit your entry to the 2019 European Championship, go to the events page at 49er.org or click the link below to be taken directly to the entry portal. Late entry fee’s apply from April 1st, 2019, so make sure you submit your entry and we’ll see you in Weymouth.